Shopping for Mass Effect Action Figures? Scott Ryder joins the Mass Effect universe! This Mass Effect Andromeda Scott Ryder 7-Inch Color Tops Green Wave #21 Action Figure comes with a primary AAX5 Assault Rifle, an alternate helmetless head, with over 14 points of articulation. 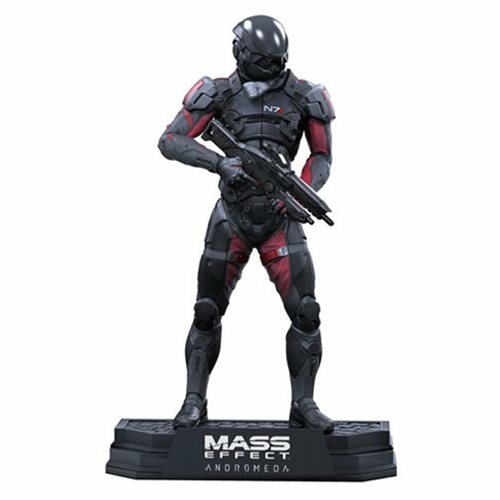 Sculpted and adapted from the next chapter of Mass Effect, Scott Ryder is shown in the iconic N7 armor and stands on a stylized brand display base. Developed by BioWare and published by Electronic Arts, Mass Effect: Andromeda is the next chapter in theMass Effect series, and gives players the freedom to chart their own course through space, leading the first humans in Andromeda on a desperate search for a new home. Ages 12 and up.